One of the iconic species of the northern California coastline is the redwood tree. The majestic trees are dependent upon another feature emblematic of the area—fog. Plant ecologist Todd Dawson describes how redwoods utilize this seasonal water source and how drought and climate change are impacting these old-growth forests. Todd Dawson is a professor of Integrative Biology at the University of California, Berkeley. IRA FLATOW: This is Science Friday. I’m Ira Flatow. 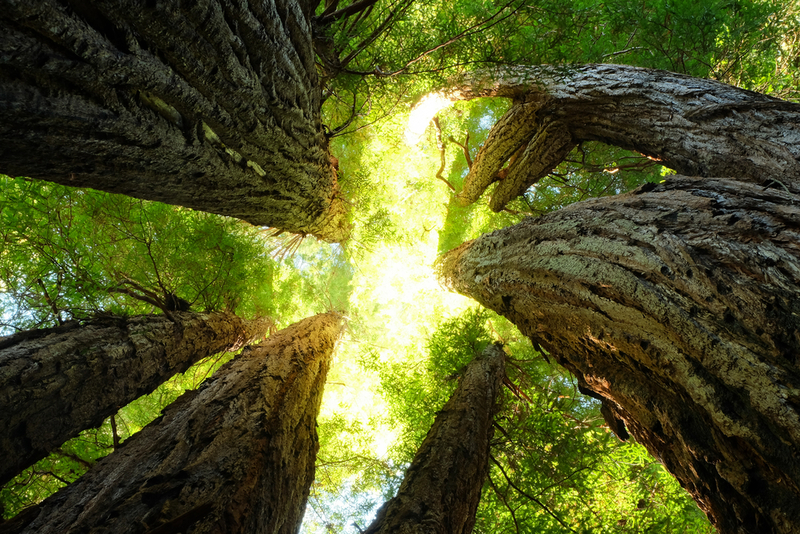 The redwood trees of California– you know, they are iconic symbols of the Golden State. And if you’ve stood at the base of one of these ancient giants and you’ve looked straight up into the canopy, you know the experience can be transformative. But there’s one feature that might be just as thought provoking as the Redwood tree in California. Any guess? I’m talking about the fog, hey? If you drive along Route 1, you’re bound to be fog bound toward dusk, somewhere along the day. And you may not realize it, but these two famous features of the California coast– the redwoods and the fog– are linked together. My next guest has studied their relationship and is here to reveal how the drought and climate change are affecting these towering trees. Todd Dawson is a professor of integrative biology and environmental science policy at the University of California Berkeley. TODD DAWSON: Thank you, happy to be here. IRA FLATOW: Nice to have you. Tell us, how is rain– yeah, we know about fog and rain. Is fog different than rain, how they both affect the redwood tree? TODD DAWSON: Yeah, it really is. I mean, the fog, of course, comes in off of the ocean in a horizontal way. And it’s kind of pulled on to shore each night. As the Central Valley of California heats up, the air rises. And when that air rises, of course, it draws the fog banks in where rainfall, of course, comes out of the Gulf of Alaska here in California. And it, of course, falls directly vertically out of the sky. So one form of water is coming down vertically, and the other one’s coming in during the summer months horizontally. IRA FLATOW: But, you know, we kind of think of water as water, you know? Does it affect the tree? Is there something different in one kind of water in the water itself? TODD DAWSON: Well, you know, the important things about the fog bank are kind of two fold. A, they come during the summer months when we don’t have any rainfall here in California during our Mediterranean climate. And not only do they bring water when they come in off the ocean, they also bring other nutrients that are kind of dissolved in the fog– things like nitrogen. And we know all plants really require quite a bit of nitrogen to grow. And so they’re getting both water and nutrients from the fog mix. IRA FLATOW: Gosh, I didn’t think– so the fog is sort of fertilizing the plant? TODD DAWSON: Indeed it is, yeah. IRA FLATOW: Wow. Does it help the trees grow, if it’s sort of a natural fertilizer with the nitrogen in it? TODD DAWSON: It definitely does. We’ve published some work where we’ve shown that this fog that comes in, as I said, you know, it provides both a subsidy of nutrients and a subsidy of water. And it comes during a very, very important time in the year for that tree, during the long summer months when the temperatures are warm. And the growing seasons are long, so these resources are really important for redwood trees. IRA FLATOW: Now, I read that you conducted a study where you can actually see when the tree was fed by fog or rain. And you do that through the tree rings. TODD DAWSON: Absolutely. Yeah, it was one of the coolest things. We didn’t know if it was going to work. But when we got some great cores out of these trees and we analyzed, actually, different parts of a single year’s worth of growth, we could see in the cellulose that’s being made by that tree a signature of either winter rainfall at one part of the year or summer fog during the other time of the year. IRA FLATOW: What’s different about the cellulose from one to the other? TODD DAWSON: Well, the main thing is that cellulose, as we all know, is composed of a bunch of different elements. And some of those elements are carbon, some are hydrogen, and some are oxygen. And the hydrogen and the oxygen in the cellulose come from the water. And we know that, by analyzing sort of the chemical composition of winter rainfall versus summer fog, they carry sort of different fingerprints. And because of that, that gets also locked into the cellulose that’s made in that tree ring. IRA FLATOW: Does the stuff that might come up through the roots have a different composition than what’s coming up in the fog? TODD DAWSON: It can at certain times of the year. Say, for example, if the fog drips into the soil and is being taken up by the roots, then some of that will come in directly up through the root system itself. But one of the other things that we discovered about fog during the summer months is not only can it be taken up by plant root systems, but it can also be directly absorbed through the leaves directly into the canopies. IRA FLATOW: Wow. Now, that’s interesting. And I know that these trees can live for, what? 600, 800 years or more? Have you seen any patterns in climate change when you’re studying these tree rings over all this time? TODD DAWSON: Well, you know, these trees can live to be much older than that. In fact, I think the oldest coastal redwood tree is known to be more than 2,500 years old. So we’ve got a couple of millennia of tree rings that we can go back and look at. And we have been doing that. And one of the things that we’ve been discovering is that, when you take the long view by analyzing both the tree ring widths and also their isotope composition, we begin to see some cycles of drought and rainfall and fog that show up repeatedly in the long tree ring record. So these redwood trees definitely are good recorders of climate and climate change. IRA FLATOW: So you can actually see in the tree rings the evidence? IRA FLATOW: And I know that California is in its fifth year of a drought. But the coastal redwoods are actually growing at a faster rate. Does that have to do with the fog? Or what was happening there? TODD DAWSON: Well, we think that in some of the places where coastal redwoods grow– and that’s mostly in the northern part of their range– they do seem to show an increase in growth. We don’t know exactly why that’s happening. But one of the hypotheses that’s out there that needs to be further tested is that, as the fog has actually declined over the last 60-70 years, the light has actually increased. And it may be that these trees are growing more because there’s actually more light for them to grow on because that’s what photosynthesis actually requires. But we don’t see that growth spurt all places throughout the redwood range. If you go down to the southern part of the redwoods, we see that the growth actually hasn’t increased. And it might be because, in that part of the range, its already a lot warmer. There’s less rain input. And there’s also less fog input. So it’s not universally true that all redwoods are growing better along the coast. IRA FLATOW: So you’re actually seeing the effects of the drought, then, in the southern part of the state? TODD DAWSON: We see more so in the southern part of the state, and we certainly see it in other parts of the state. So of course you know that there’s two redwood trees here in California– one that grows along the coast and one that grows up in the Sierra Nevada mountains. And the ones in the Sierra Nevada, along with all the other trees that live up there, are the ones that are really feeling the drought. And that’s actually where we see not only decreases in tree growth but increases in tree mortality. IRA FLATOW: Now, I know there are groups that are out there cloning trees to combat climate change. What do you think of this plan? TODD DAWSON: Well, I find it an interesting idea that these guys are largely horticulturalists. They’re going out there. They’re climbing some very large trees, getting the new, rapidly-growing foliage. And then they’re tissue culturing these with the idea that some of these big trees probably have genetic superiority in terms of their ability to grow fast and sequester carbon. So the idea is an intriguing one. I’m not sure whether or not we can actually grow enough redwood trees to make a difference on carbon sequestration across our planet. But I think the idea of trying to do something like this has some merit. IRA FLATOW: Given climate change and the drought in California, what is the future of redwood trees here? TODD DAWSON: Well, it’s a really good question. And it seems that during this five year drought, the trees up in the Sierra– which I mentioned before, the giant sequoia– they seem to be the ones that might be most affected by this drought. And that’s largely because not only has it come with warmer temperatures, but it’s come with a lower snow pack. And that snow pack is really very important for the giant sequoia. And when they don’t have it, they don’t get the groundwater recharged. You contrast that to the coast redwoods, and they have still been getting that summer fog. And so they don’t seem to be as affected by this current drought as the trees that are growing up in the mountains. IRA FLATOW: Is there a difference between the studying the redwoods and their cousins, the sequoia? TODD DAWSON: There definitely is. I mean, the giant sequoia that grows up in the Sierra, they seem to be a tree that’s much more drought tolerant. They can tolerate, of course, some very cold winters when the snowfall comes. And the coastal redwood doesn’t seem to be as drought tolerant as that tree that grows up in the Sierra. So there are some differences, both in not only were they live but also in their physiological tolerances to things like drought. IRA FLATOW: Now, I know that you’re interested in the snow pack. You’re interested in the growth of the redwoods. What don’t you know now, you know? What do I know that I don’t know that I would like to know if I could know that? TODD DAWSON: Well, some things we’d like to know as we march into the future is how these trees might respond to the projected climate changes that are now kind of being rolled out in many of the models here. So some of those models suggest that things are going to continue to get warmer. Rainfall is probably likely to change in its overall patterns and particularly in terms of how much the moisture that hits California actually comes as rain versus as snow pack. And so what we’d really like to try to know as we go into the future is how these new sort of climate challenges that redwoods really haven’t seen to this extent in the past, how are they going to respond? Are they going to be able to keep growing? Will their ranges shrink? How will seedling recruitment and forest structure change as we march into a climate change future? IRA FLATOW: Now, I know that you’ve been studying redwoods for 25 years. What have you noticed in all those years? What strikes you the most? TODD DAWSON: The thing that strikes me the most is really, even though they have very narrow ranges, just how resilient they are to some of the factors that are kind of impinging on them. And so even though they’ve been cut down, they seem to be able to regrow. So they have a great deal of resilience. And I think that’s a very important characteristic for redwoods because it means they’re going to be pretty tolerant of the kinds of things that are being thrown at them as the climate changes into the future. IRA FLATOW: Well, we thank you for taking your time to share your knowledge. And good luck in the next 25 years. TODD DAWSON: All right. Thanks very much, Ira. Pleasure to talk with you. IRA FLATOW: Thank you very much. Todd Dawson is a professor of integrative biology and environmental science policy at UC Berkeley. Blue whale populations are only a fraction of what they once were globally, but a California population has nearly made a comeback. In this 1993 interview from the Science Friday archives, writer John McPhee talks plate tectonics and global geology. This bubblegum-pink sea slug is cropping up in areas where it's rarely seen in large numbers.